The Royal Yacht Squadron in Cowes, Isle of Wight, UK, has announced the inaugural Biscay Race, which will form part of the Atlantic Ocean Racing Series (AORS). The Biscay Race is also open to any yacht only wishing to compete in this historic race. 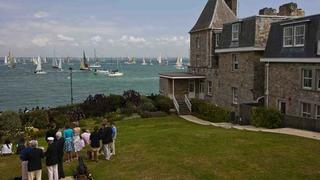 This will be the first offshore race that the Royal Yacht Squadron has run. Its decision to make this foray into offshore racing was prompted by the fact that it was the only club out of those that formed the Atlantic Ocean Racing Series - the others being the New York Yacht Club, the Royal Ocean Racing Club, and the Storm Trysail Club – that did not have a race that was part of the new circuit. Observing a large gap in the sailing calender between the the Rolex Fastnet and the Rolex Middle Sea Race, which the Royal Ocean Racing Club is involved in on the east side of the Atlantic, the Royal Yacht Squadron felt this was an ideal opportunity to contribute something to the exciting racing series. 'The Royal Yacht Squadron has for many years been organising some of the best inshore regattas in the UK and for us, to be a true part of this new AORS event, we needed to show that we could also run a first rate offshore event as well,' says RYS Commodore Yachting, David Aisher. Organised by the Royal Yacht Squadron with the assistance of Real Club Náutico de Sanxenxo in Northern Spain, the Biscay Race will start from the Royal Yacht Squadron line at midday on Sunday 11 September and finish at the yacht club in Sanxenxo. • The minimum crew on any yacht shall be three apart from as allowed under NoR 5.5, Two Handed Class. • The minimum size for yachts is determined by their rating and their SSS/STIX numbers. • The minimum LOA for multihulls is 9.15 metres/30ft. There is no maximum size. • Experience: at least half the crew, including the person in charge, must have completed an offshore race of at least 300 miles in the yacht in which they will race the Biscay Race, in the 12 months preceding the start. Previous legs of the Atlantic Ocean Racing Series, including the Rolex Fastnet Race, will qualify under this requirement. Interest has already been received from two yachts who recently competed in the Transatlantic Race 2011, the fourth race in the Atlantic Ocean Racing Series: George David’s Rambler 100 (USA) which set the benchmark for the new transatlantic route from Newport, Rhode Island (USA) to The Lizard (UK) and British Soldier, the Army Sailing Association’s A40. Both are going on to compete in the classic offshore race, the Rolex Fastnet Race. Interest has also been received from Alex Thomson’s IMOCA 60, Hugo Boss (GBR), whose sights are set on the Transat Jacques Vabre later this year. A number of the other TR2011 boats are also expected to take part. Racing for the Biscay Armada Dish, The Biscay Race may also act as a feeder race for competitors in the Rolex Middle Sea Race (22 October) as well as those wishing to sail to the Mediterranean and could also attract yachts taking part in World Cruising Clubs’ Atlantic Rally for Cruisers (ARC) which sets off from Las Palmas, Gran Canaria for St Lucia on 20 November. As an added incentive, The Real Club Náutico de Sanxenxo is offering free berthing for a week to competitors on completion of the race and a prize-giving dinner will be held by the kind invitation of club on Friday 16 September for all crews. The Atlantic Ocean Racing Series (AORS) organised by the New York Yacht Club, Royal Yacht Squadron, Royal Ocean Racing Club and Storm Trysail Club includes the Pineapple Cup – Montego Bay Race, RORC Caribbean 600, Annapolis to Newport Race, Transatlantic Race TR2011, Rolex Fastnet Race, Biscay Race and the Rolex Middle Sea Race. Of the seven races in the AORS, three races, including the TR 2011 must be completed to qualify for a series victory. Each race is weighted equally in overall series scoring with the exception of TR 2011, which is weighted 1.5 times. All entered yachts are scored using their two best finishes in addition to the TR 2011. Awards for the AORS will be presented in November 2011 at the New York Yacht Club’s Annual Awards Dinner in Manhattan.